If you are having problems with your septic system in Lakeland, the best option is to call our septic tank repair team. Dealing with a septic tank problem isn’t anyone’s idea of a good time, but it’s important to get the issue resolved as quickly as possible to prevent the situation from becoming much worse. At William Dustin Septic, we provide septic tank repair services, along with a variety of other services to make sure your septic system is working properly. Some of the most common problems that homeowners and business owners tend to experience with their septic tanks include soakaway failure, issues with soil, and tank deterioration. Soakaway failure can occur if the tank becomes too full, which often results in a backup of toilets and drains in your home or office. Signs of this problem might also include gurgling sounds from the drains, frequent toilet overflowing, or slow flushing or draining. If you do experience soakaway failure, the solid waste could cause serious damage to your landscaping and create a messy and unpleasant situation in your yard. Soil issues might occur if the tank or aspects of the septic system aren’t buried deep enough in the ground, or are buried too deep. You could notice problems with the trees, bushes, flowers, or other plants in your yard. Your lawn could even have large brown patches over where the tank is buried, which is an indication of a soil problem. A septic tank requires the presence of bacteria, but if only anaerobic bacteria are present, it produces an excess of slime at the entrance to the septic tank. The presence of too much slime can deteriorate the tank, causing waste to leak out and damage the ground around it. For any of these common septic problems, the best option is to call our septic tank repair team at William Dustin Septic. 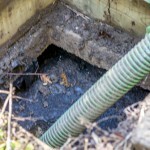 We have a lot of experience with septic tank repair, and we can diagnose many different problems. We can take care of even the toughest and dirtiest septic jobs. Believe it or not, septic pumping is NOT always the answer! We can also help you take steps to avoid damage to your septic tank. Routine maintenance is critical for every septic system owner, and our team of experienced technicians can take care of the required maintenance. Septic tanks should be pumped at least once per year to eliminate sludge buildup. By having your tank pumped, you can avoid the issue of soakaway failure, since this happens when the tank gets too full. During the pumping service, our technicians can also inspect your tank and other components of the system to look for signs of wear or damage. By pinpointing and repairing potential issues early, you can avoid a major septic tank repairs or failure. If you have questions about your system or would like to schedule one of our septic technicians to come out and give you a free estimate for septic tank repair in Lakeland, Florida, please give us a call. We offer 24-hour, 7 day a week emergency service as well. They came to our rescue in record time.